DO YOU KNOW SOMEONE WHO SMOKES? OR DO YOU? 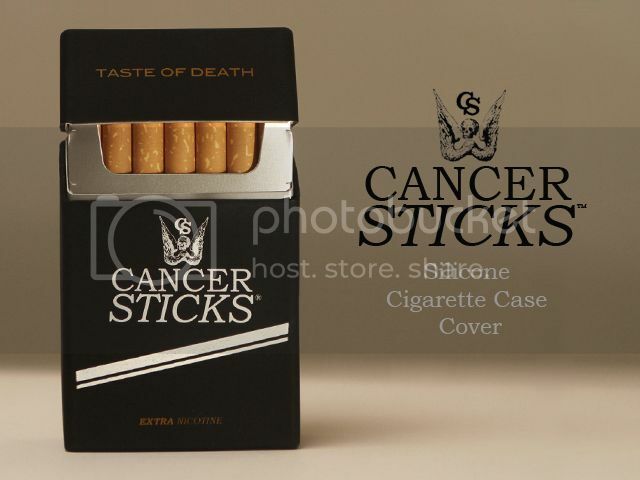 After the exciting launch of my first Crowdfunded project, I then launched the CANCER STICKS™ silicone cigarette pack cover. This simple rubber case is perfect for anyone who smokes and slips easily on to any standard 20-pack of cigarettes. The cover beautifully highlights the dire consequences of smoking in its title and transforms each pack of cigarettes into a newly branded warning about the danger of this dirty habit. The CANCER STICKS™ cover is made of silky-to-the-touch silicone, which means it'll easily transfer from pack to pack as each one is finished. I've designed it so so that the background colour is black, in order to minimise fingerprints and dirt showing up after frequent use. 5% of the profits from the sales of the CANCER STICKS™ cover will be donated to these Charities: the Cancer Research Fund, the British Heart Foundation and Macmillan.